Blair students help elementary school students learn chess in the Chess for Success Saturday program and Blair H.S. Do you want to try something different? Try the Chess for Success Club. 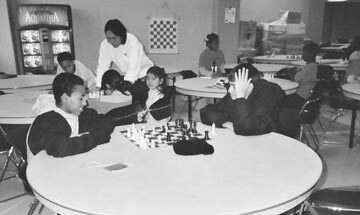 Chess for Success is a club that has been taking place for many years in different community centers and schools. Mr. Moreno, a counselor of the ESOL department, started this idea around eleven years ago when he was working in Washington, D.C. "The purpose of this is to help immigrant students feel comfortable, think right, and take good examples of playing chess into the real life," he said. This club takes place at Blair High School every Saturday morning and Wednesday afternoon and also at Oak View Elementary School on Tuesdays and Thursdays. "Anybody is welcome to join in the chess club," Mr. Moreno said. There are students from different countries such as Koreans, Salvadorians, Dominicans, and different countries in Africa. William Osorio, a 9th grader at Blair, is one of the students who goes every Wednesday to learn new skills and practice. He started playing one year ago. "I like to play chess in Mr. Moreno's chess club because it helps me to see my life with clarity in the way of making good decisions and resolving my problems," William said. On Saturdays many students from middle school go to Blair to play chess and adults and Blair students go to help Mr. Moreno. Elvis Aybar, a Blair student, goes on Saturdays and teaches middle school students. "I like to teach students form middle school because what I teach them about chess might be helpful to some of them. I don't know in what manner, but I know it might help them," Elvis said. Pablo de Garate and Miguel Gatti are adults who go on Saturday to be volunteers who like to spend time teaching and playing chess with M.S. students. Pablo works at the embassy of Spain. He started to play since he was 5 years old. Even though he does not speak English well, he tries to speak it. "I come on Saturday because I like to play chess and I want to diffuse it throughout the Spanish speaking community because this is one way to communicate with other people, in this case with middle school students," he said. "Sometimes it is difficult to teach children because sometimes children can't pay attention. However rules and basic movements are the first things they need know." Miguel Gatti from Paraguay has been playing chess for 34 years and likes to teach chess to middle school students. "Chess helps to have discipline, knowledge and improves intelligence," he said. Edgar Molina, a middle school student has been playing for three years and realizes that playing chess is not just for fun; it is to get something for the real life. "Winning and losing is one of the things I have learned while I have been playing chess because it makes me respect my opponent," he said.
" In life, effort helps us have good results that make anybody feel great about him/herself," Mr. Moreno said.